Synopsis: The incredible new novel and brand new world from the international bestselling author of the Wool trilogy.The old world is buried. A new one has been forged atop the shifting dunes. Here in this land of howling wind and infernal sand, four siblings find themselves scattered and lost.Palmer has never been the same since his father walked out twelve years ago. His elder sister, Vic, is trying to run away from the past; his younger brothers, Connor and Rob, are risking their lives to embrace it. His mother, left with nothing but anger, is just trying to forget.Palmer wants to prove his worth, not only to his family, but to himself. And in the barren, dune-covered landscape of his home, there is only one way to earn respect: sand-diving. Plunging deep below the desert floor in search of relics and scraps of the old world. He is about to embark on the most dangerous dive of his young life, aiming to become the first to discover the rumoured city below.Deep within the sand lies the key to bringing his family together - and tearing their world apart. Howey has quickly cemented himself as one of the best young adult fiction writers currently around thanks to the critical success of his Wool trilogy. Sand is his latest novel since then and marks him out as a truly talented author capable of crafting both great stories and wonderful characters. 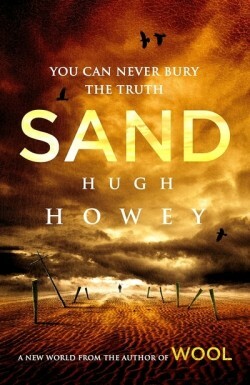 What struck me immediately about Sand is that Howey’s prose is elemental. Like all great writers, the landscape becomes a character in itself. Under the harsh sun Howey’s visions of dry, dusty deserts frequented by sand-divers is exciting and vivid, and imagining them comes with ease as you almost feel the grains of sand falling from the pages of the book. What is immediately clear is that Howey has vision and scale comparable to Reeve and Pullman, and just for a moment the reader shares his vision immersed and enthralled Springston and Low-Pub, two salvage communities and the last bastions of human civilization caught on the edge between life and death. If he nails the macro, Howey also effortlessly delivers the micro. Howey may be writing about a world alien to us: a world in which civilization has been buried beneath waves of sand, where millions of lives have been forgotten and snuffed out. His is the world of sand-diving, of recovering hidden treasures, life in the shade of the wall that keeps the dunes from swamping Springston, life on a knife edge caught between survival and death. Yet amongst the sand the lives of Palmer, his sand-diving sister Vic, brothers Conner, Rob and their brothel-owner mother are instantly recognisable: they are our lives, our annoyances, our ambitions. Deserted by their father and husband, Sand starts out as a story of familial tribulations before turning into a story of life and death as the horizon broadens, expands and reveals old secrets from the ancient world buried under the dunes. Sand, at its core, is not the story of one person but that of a family: Palmer’s family, and as Howey jumps from character to character he creates a rich tapestry of voices and characters that are, more than anything, lovable. Howey’s success lies in his marriage of setting and character. It is an equal marriage, balancing the elemental whims of weather and terrain with the personal struggle for a fulfilled life and, in some cases, survival. His ability to carve stories from landscapes is what makes Sand a success and marks him out as a writer to keep an eye on.